Set ye compass for There, this week, gar! We’ll set sail towards some treasure and adventure, leadin’ the way toward high seas keepin’ you off the planks, away from the gators and Davy Jones’ locker too, argh! Grab yer rum and join us for Pirates of the Theribbean September 24th through October 7th! We’re hankerin’ for a good ole time, and we know how t’ give it too, just take a peek at all these fantastic events planned for you, shiver me timbers! Follow Elliot the baby crocodile on his adventure to explore the life of a pirate. Finish this quest before it times out for a chance to be entered into a drawing for a hoverboat. Have you seen the movie the Pirate Fairy? It is a Disney movie about Tinker Bell’s adventures. This quest only runs till Tuesday, September 27th. A handful of quest finishers will win 2,000 Tbux. Pirate’s BINGO on the barrrrrrrrrrge! 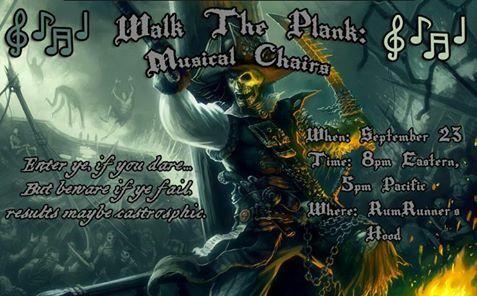 Spot ye’ dabbers or walk the plank. Sign up ahead of time at www.ultimatetherebingo.com to get access to the bingo cards. Play BINGO on September 27th and October 3rd. Bring yer rum and join us fer an open mic pirate night! Sing ye hearts out, tell a spooky tale, give us a belly laugh with comedy or gross the crowd out in the burping contest. Sign up September 27th at 6:00 pm PDT. Avast ye scurvy avies! Trivia of all types, and a bunch of Star Trek questions as well. Be there early to ensure a seat to play. Triviarrrrr kicks off at 8:00 PM PDT on Tuesday. Cast your sales, and collect them points, They be booty ya know, if ye be late, we will have ya walk the plank! Eight minutes after the event begins we be cut’n the sales and be off Arrgggg! Show up to collect yer booty at 4:00 PM PDT on Wednesday the 28th. Arrrh, every pirate fer themselves. Try to find the booty before ye get shot. No flintlock experience required. Sign up September 28th at 7:00 pm PDT fer some paintball plundering! Set sails on a Cross Country Race pirate style! 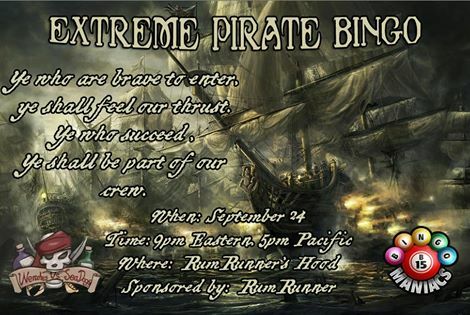 Sign up fer adventure on the high seas on September 30th at 5:00 PM PDT. Me 1st mate lost me property and got the plank fer it! Join me pirate crew. Find me goods. Return it to me and reap yer reward. Search for Kate’s booty on October 2nd at 6:00 PM PDT. Can’t count on pirates t’ play an honest game o’ Spades. This week there is a prizes to tournie winners! Cut ye cards on Octber 2nd at 7:30 PM PDT. 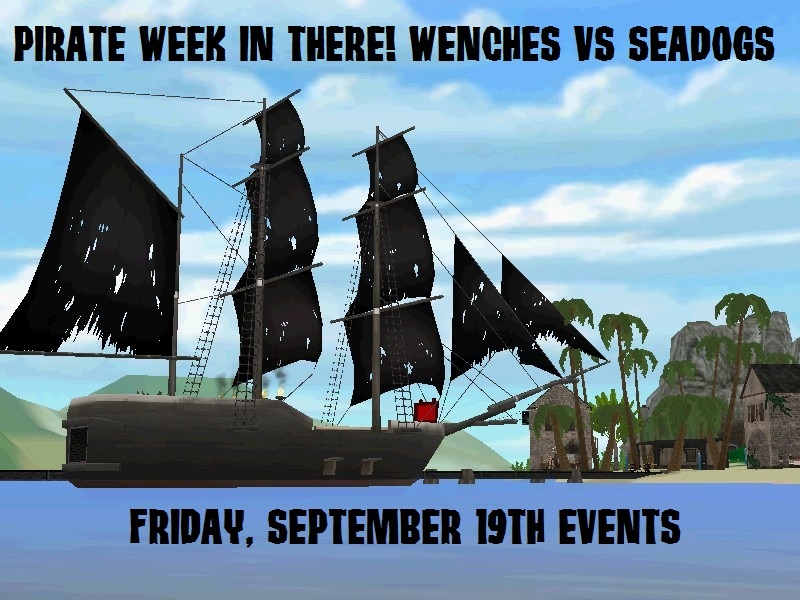 More events be poppin’ up during Pirates of Theribbean week in There. Check ye’ old Activities page for more events and sign up. Hoist ye sails, tis the end o’ Pirate Week in There! Shiver me timbers! Tis been a long battle of fightin’ and blunderin’ as ye ol’ Wenches and Seadogs been wrestlin’ fer ye Crew List. Grab yer pegged leg, hooks, eye patch or whistlin’ shoulder parrot and join us in celebratin’ the last great battle of Pirate Week in There. Description: Avast you SeaDogs and ye wenches, a Bingo game be held here, while we take a enjoy the entertainment from the Extreme Dancers. Description: We ain’t lettin’ the pirates keep us from a hootin’ hollerin’ good hayride. RIGHT?! Featuring Hayride Hoveboat by Carpenter. Description: Who rules and who drools? Will we have a new king or queen? Last chance to wear your pirate gear. Description: Sponsored by sidvicious2008, first prize 10k, second prize 5k. Description: Grab ye parrots n’ hooks n’ get ready to party! Scurvy pirate music for ye everyday band o’pirates! Dancing made to match the music! Description: Be aware, as you enter into the pirate ship, there will be pirates watching your every move. Dance around the chairs or get your booty kicked. 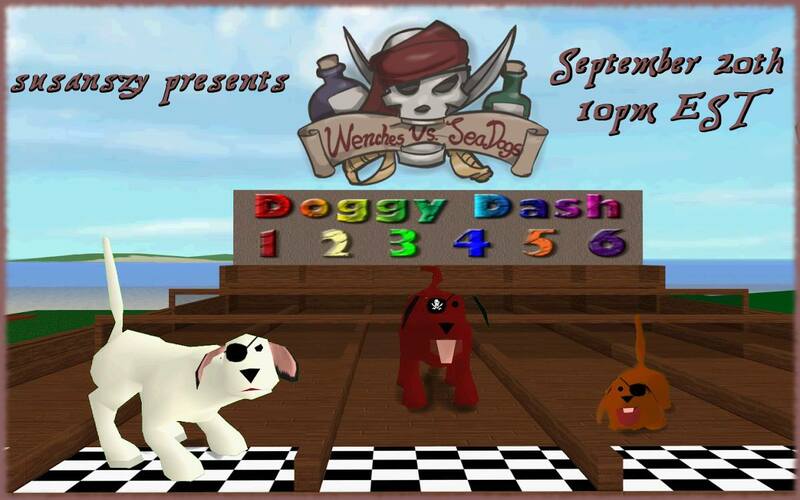 Description: Sea Dogs vs Wenches! Aaaarrr! Who will prevail over the abuse to reach the end first? Description: Tuesday Tiki Talk Trivia with a pirate twist! Test ye ol’ trivia knowledge!